Fortnite was exclusive to Samsung smartphones till August 12. The game is now available for select Android smartphones. You can download the APK from Epic Games' website and wait to get an invite to start playing the game. The wait for Fortnite on Android has been long. The game is finally available on a select list of Android smartphones. 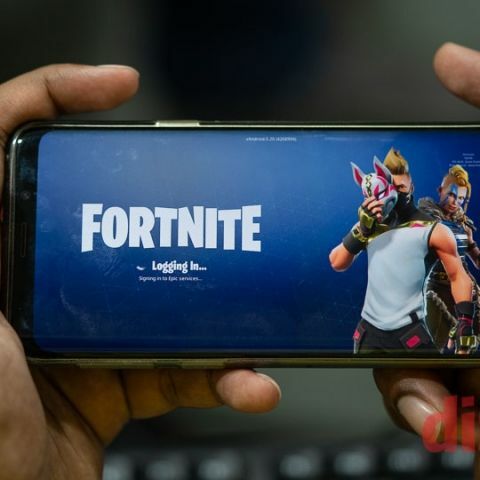 Fortnite for Android was exclusive to Samsung Galaxy series of smartphones till August 12. Now that the exclusivity has ended, you’d think playing the game is as simple as installing the APK from Epic’s website. But it isn’t. you will have to wait for an invite to begin playing the game even though you can download it now. Before we tell you how to get the game, make sure you have one of the following smartphones or that your Android phone fulfills the criteria for playing Fortnite on Android. As per Epic, You will need a high-end Android device to run the game. The company says your smartphone will need to be on Android 5.0 Lollipop or higher and have a minimum of 3GB of RAM. On the GPU front, the smartphone will need to have a minimum of Adreno 530 or higher, Mali-G71 MP20, and Mali-G72 MP12 or higher. Downloading the game is easy. All you need to do is visit the Epic Games website on your smartphone and sign in with your account. If you don’t have an Epic Games account, you can create one. Once that’s done, you will have to select the device you will play the game on. As of now, the game is supported on a limited number of smartphones. Once your registration is complete, you will receive an email to download the APK. Remember, since Epic is not distributing the game through the Google Play Store, you will need to give permission to download the game from other sources. Once the APK is installed, you can fire up the game and wait for the 1.88GB game data to download. How long that will take is subject to your internet connection. 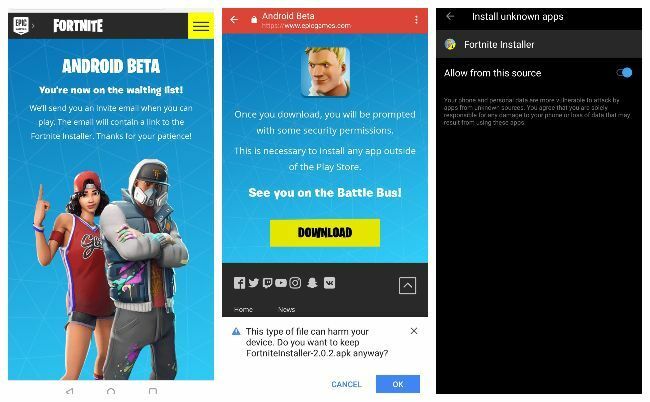 Once the game is installed, you will have to wait for the official invite from Epic Games to start playing Fortnite on Android, so technically, chances are that you still cant play the game on your smartphone. How to play Fortnite on Android Now! There is only one way to play Fortnite on your Android smartphone now. Make sure you have a Compatible Samsung device. Fortnite on Samsung devices doesn’t need you to have a pre-existing account. Newcomers to the game can jump right in and unlike other compatible Android smartphones, you don’t need to wait for the official invite if you have a Samsung Galaxy phone.